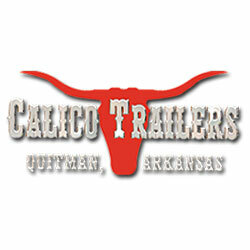 Calico Trailer Manufacturing is a family owned and operated business based in Quitman, Arkansas. Calicos are a value built steel trailer and offer a variety of trailers including horse, livestock, cargo and oilfield. At Country Blacksmith, we sell new & used Calico Horse and Livestock Trailers. Be sure to check out all of the additional options using our new product options. Customize your Calico Trailer to your specific needs, just check the options you want and then add the trailer to your cart! If you have any questions, give us a call or stop by our Carterville, IL or Mount Vernon, IL stores to talk to a trailer specialist!